Anyone with a university degree or equivalent can apply for the civil services examination. There is no minimum mark restriction. Age limit: 21 to 32 years on August 1 of the year of notification. 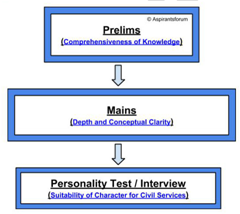 A candidate can appear in the examination six times. The upper-age limit can be relaxed in eligible cases. Multiple choice Question (MCQ) Test. Only General Studies marks are counted. 1/3 negative marking for wrong attempt. If you apply online but remain absent in prelims then the attempt is not counted. You should score at least 25 per cent marks in each of these papers to be qualified for the Mains. Two papers of these nine are of language: one for English and another for an Indian language of your choice. It is mandatory to qualify these papers but marks are not counted for final merit list. Paper – II: General Studies I (Indian heritage and culture, history and geography of the world and society). Paper – III: General Studies –II (Governance, Constitution, polity, social justice and international relations). Paper – IV: General Studies III (Technology, economic development, biodiversity, environment, security and disaster management). Paper – V: General Studies IV (Ethics, integrity and aptitude). Paper – VI: Optional Subject – Paper 1. Paper – VII: Optional Subject – Paper 2. For papers VI and VII, you may choose one optional subject from a list of 48 (25 subjects and literature of 23 languages). Is held at New Delhi and taken by various boards headed by members and Chairman of UPSC. It is of 275 marks. The total marks scored Stage 2 and the marks in the Stage 3(personality test of 275 marks) put together decide the rank in the exam. State Civil Exams of all the states follow the same process and procedure. Some part of the syllabus may vary but most of the syllabus is same. Thus reference material is also the same. The only difference is the state specific questions that are different for each state. Generally there is no limit on the number of attempts and maximum age limit is 40 years with relaxation for different categories. Have a schedule with fixed time table and target. One day for revision in a week. We have uploaded many quizzes at our website and we also provide UPSC level MCQs Daily (you might find it difficult at early stage of prep).